Hello and welcome to my Kumho Ecsta PS31 review. High-performance budget tires are becoming more popular, especially with owners of older performance vehicles. One of the most popular budget offerings come from Kumho, and the Ecsta PS31 is probably their best-known tire in the lineup because it comes in smaller sizes, ranging from 15”-18” and is best suited for compact sporty vehicles and midsize sporty sedans. The reason why these tires are so popular is primarily price – they’re much cheaper than premium high-performance tires, especially when you consider replacing all four tires, which you definitely should. Buyers often know that they will probably not get the performance they would from premium tires, but for everyday driving and some fun in the corners, budget high-performance tires are a good prospect. 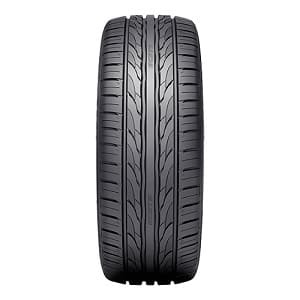 The Ecsta PS31 is especially popular between all those budget tires because of the design. Once people look at it, they simply can’t resist the temptation to put it on their cars. It has aggressive tread design, and even the sidewalls have a racing design with a checkered flag and modern font. There is even Ecsta branding on the tread itself! While that doesn’t translate into better performance on the road, it certainly gives the Ecsta brand significance and cool factor. According to Kumho, who are not strangers to extremely self-confident descriptions of their tires, the Ecsta PS31 is designed to take any driver to the next level. I myself consider a pretty good driver and this review came right in time to take me to new heights. You bet I eagerly wait to take a spin with these tires. Kumho didn’t stop there. They claim that the Ecsta PS31 proves that a perfect balance of high-speed stability, low road noise and safety can be achieved in a tire. I know that it can be achieved, but I am starting to suspect that the marketing department of Kumho again had a little too much fun exploiting adjectives in their descriptions. But, let’s start taking this tire seriously. 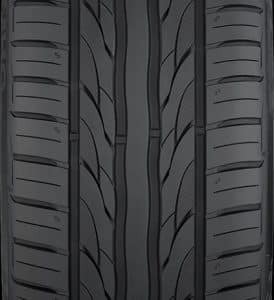 The Ecsta PS31 is a summer high-performance tire with emphasize in dry and wet handling and traction. Kumho incorporated their proprietary High Dispersible Micro Silica that distributes the silica more evenly throughout the contact patch, and High Grip Resin. Both of them improve contact with the road and enhance dry and wet traction. Moving on, the directional tread pattern with a solid center rib helps improves high-speed stability, while 3D Dimple Design keeps the tire cool in the most demanding situations, thus improving durability. The optimized lateral groove angles (0-10 degree angle range) resist irregular wear and help with better water evacuation, helped by the four wide circumferential grooves and diagonal-sipe microgrooves. In the end, the computer-simulated structure additionally helps with durability by providing uniform contact pressure, while the standard twin steel belts and two-ply polyester casing help with strength and high-speed stability. High-performance summer tires are not known for their long-lasting tread life and the Kumho Ecsta PS31 is no exception to that rule. That said, when compared to other budget offerings it does provide a little longer tread life. It’s also very strong and durable – no complaints there either. In this regard, the Kumho is very impressive – when combined with the low price and the extended life expectancy, this is a very good solution for buyers who are on a budget but still want the thrills of a summer high-performance tire. But, does the Ecsta PS31 really thrill in sporty driving scenarios? Well, it’s certainly better than normal summer or all-season tires. It does provide the driver with more precise steering feel and it feels responsive in tight corners. High-speed stability is also good, but not exceptional. The problem for the Kumho Ecsta PS31 is premium high-performance tires, which raise the bar up a notch. As always, the price makes a difference here – a set of Bridgestone Potenza RE001 tires will be even more responsive and even more stable at higher speeds, and that’s something that you can really feel behind the steering wheel. If you don’t drive very aggressively, the Kumho will be a good choice, but for best performance in the corners, the Ecsta PS31 doesn’t even come close to the Potenza RE001. It is almost the same story in wet conditions. The Kumho Ecsta PS31 is very good in rainy conditions, both in light and heavy rain. It has a lot of traction and resists hydroplaning very well, but there are still better tires in this category if you want the best possible wet traction, namely the Falken FK452. For the price though, I will not complain much – the Kumho is reasonably good in the wet. This is a summer tire and it should absolutely not be used in winter, and especially in snow. If you do that, expect almost no traction when accelerating, no handling responsiveness and infinitely long braking distances. You simply must replace the Ecsta PS31’s with winter tires, even if it doesn’t snow in your area because they lose grip in dry and cold weather. High-performance summer tires are notoriously bad for comfort because of the small and strong sidewalls. 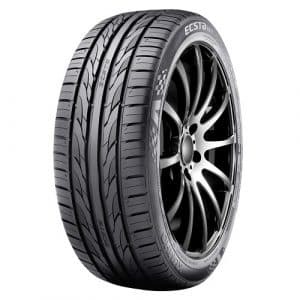 While I wouldn’t call the Ecsta PS31 comfortable, I would say that it surprises with how comfortable it is, given the fact that it’s a high-performance tire. Most competitors offer a worse ride on bumpy roads, even some premium ones. On the other hand, noise is a problem with this Kumho. It produces a humming noise even at lower speeds and it can be especially loud at highway speeds. The problem is even more prominent in compact cars which simply don’t have enough sound insulation. The Kumho Ecsta PS31 is sort of a mixed bag. Its biggest advantages are the lower price and the attractive design, while it also offers long tread life for a high-performance tire. However, don’t expect performance in dry and wet conditions at the level of the likes from Bridgestone, Falken, and Continental, all of which offer better handling properties. Thanks for reading and I hope you found this Kumho Ecsta PS31 review helpful. If you have any questions or comments please feel free to leave them in the comments section below.